Mgahinga gorilla national park is the smallest park in the country. It is about 33.7sq km and situated in south western Uganda, in Kisoro district. The British administration declared the area a game sanctuary in 1930 and it was finally gazetted in 1991 and it is part of the Virunga conservation area. The park takes its name from "Gahinga" - the local word for the piles of volcanic stones cleared from farmland at the foot of the volcanoes. 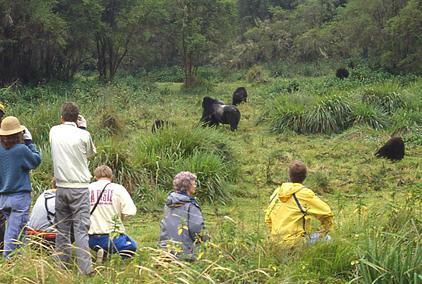 Mgahinga is home to the habituated Nyakagezi gorilla group that can be visited while on a Uganda safari - a fairly nomadic bunch that has been known to cross the border into Rwanda and the Congo. The family includes the lead silverback Bugingo who is around 50 years old and father to most of the group; his silverback sons, Mark and Marfia; and two blackbacks, Rukundo and Ndungutse, who love to pose and play in the trees. The two females, Nshuti and Nyiramwiza, both have babies Furraha and Nkanda respectively. The mountain gorilla (Gorilla beringei beringei) is one of the two subspecies of the eastern gorilla. There are two populations. One is found in the Virunga volcanic mountains of Central Africa, within three National Parks: Mgahinga, in south-west Uganda Volcanoes, in north-west Rwanda; and Virunga in the eastern Democratic Republic of Congo (DRC). The other is found in Uganda's Bwindi Impenetrable National Park. Some primatologists consider the Bwindi population in Uganda may be a separate subspecies though no description has been finished. As of November 2012, the estimated total number of mountain gorillas is around 880. Mgahinga is situated about 15 kilometers (9.3 mi), by road, south of the town of Kisoro and approximately 55km. Accommodation facilities catering for both up-market, medium range and budget visitors are available. Uganda has an association of tour operators. Click here to view a full list of its members and their physical contacts.